- A 30,000-metre drilling program has been under way at the Beaufor Mine since the beginning of 2018 to increase the resources and extend the mine life. Montreal, Quebec, Canada, March 27, 2018 – MONARQUES GOLD CORPORATION (“Monarques” or the “Corporation”) (TSX.V:MQR) (OTCMKTS:MRQRF) (FRANKFURT:MR7)is pleased to report new results that mark the end of its 2017 drilling program at the Beaufor Mine. The results are from a total of 7,157 metres of drilling in 52 holes, including 5 exploration holes (2,651 metres) and 47 definition drill holes (4,506 metres). The holes were drilled in multiple areas of the mine, including zone Q, QH2 and 32 and the 350H, 1700 and Granodiorite East projects (see composite schematic section). Zone Q is the main zone currently in production at the Beaufor Mine. Two holes were drilled in the eastern part of the zone, outside the known reserve and resource envelope, to test for structural continuity and the presence of mineralized veins in the hangingwall and footwall. Holes 142-89 and 142-95 (see section 1690E) were drilled to a final depth of 654 and 460 metres, respectively. Both holes intersected Zone Q, as well as mineralized veins in the footwall of the zone (QF veins). 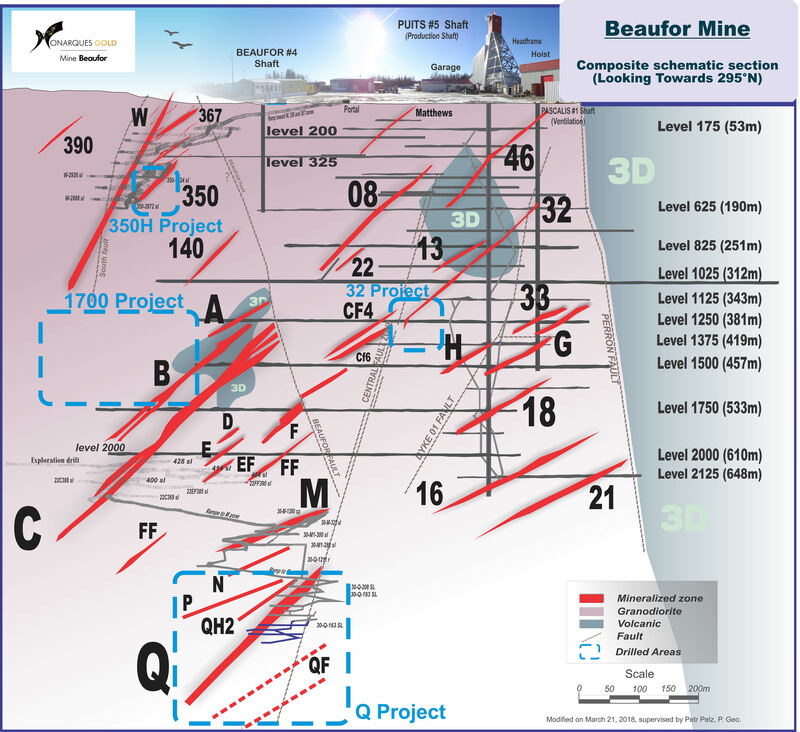 Hole 142-89 intersected 7.55 g/t Au over 4.00 metres, including 20.80 g/t Au over 1.00 metre, as well as 11.75 g/t Au over 2.00 metres and 24.25 g/t Au over 1.00 metre. 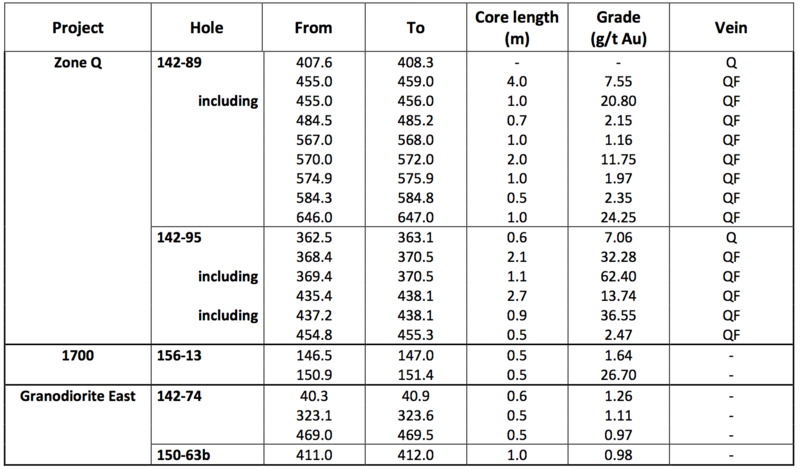 Hole 142-95 intersected 32.28 g/t Au over 2.10 metres, including 62.40 g/t Au over 1.10 metres, and 13.74 g/t Au over 2.70 metres,including 36.55 g/t Au over 0.90 metres. The characteristics of the QF veins are similar to those of the typical known veins at the Beaufor Mine, which are quartz-tourmaline veins with disseminated pyrite associated with diorite dykes. Three other exploration holes (142-74, 150-63b and 156-13) were drilled in the 1700 and Granodiorite East project areas, for a total of 1,537 metres. The 1700 project returned the best result, with 26.70 g/t Au over 0.50 metres in Hole 156-13 associated with a quartz vein containing 30% pyrite. Additional drilling is needed for a better understanding of the geometry of the veins in this area, as little is currently known about their extensions. Six holes were drilled for a total of 1,504 metres. Hole 150-64 tested the eastern part of Zone Q and the remaining five holes were drilled in the western part of the zone. All the holes intersected Zone Q, and some also intersected QH veins less than 100 metres into the Zone Q hangingwall. 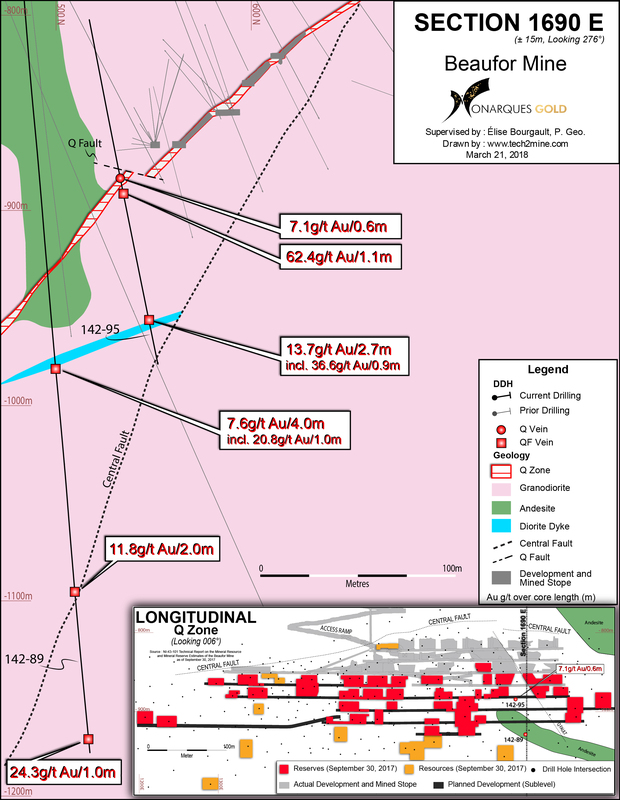 Hole 101-100 intersected 13.41 g/t Au over 4.75 metres, including 89.85 g/t Au over 0.50 metres. Hole 101-183 intersected 18.75 g/t Au over 0.50 metres. Hole 150-64 intersected 22.40 g/t Au over 0.70 metres and 58.90 g/t Au over 0.60 metres. Hole 101-100 intersected 46.95 g/t Au over 0.65 metres. Hole 101-104 intersected 16.63 g/t Au over 0.70 metres. The correlation between the QH and QF veins, located at various distances apart in the Zone Q hangingwall and footwall, is not yet well understood or defined, and additional drilling is needed to better understand their geometry. Twenty-two infill holes were drilled on a 12.5 m by 12.5 m spacing from the 193 sublevel in Zone Q, for a total of 1,286 metres of drilling. The holes confirmed the continuity of the zone over a distance of approximately 120 metres along strike and approximately 50 metres vertically. Hole 146-37 intersected 17.34 g/t Au over 3.30 metres, including 59.00 g/t Au over 0.80 metres. Hole 142-90 intersected 10.11 g/t Au over 2.50 metres, including 27.40 g/t Au over 0.55 metres. Hole 142-80 intersected 11.25 g/t Au over 0.75 metres. Zone QH2 is a QH-type vein located in the eastern part of Zone Q. It dips an average 30 to 35 degrees to the south (compared to 45 degrees for Zone Q) and sits an average of about 30 metres into the Zone Q hangingwall. The drilled area is accessible from the 193 sublevel of Zone Q and a drift is currently being driven towards the zone. Additional drilling is planned in an adjacent area to confirm the vein extensions to the east and at depth along the structure. Three holes were drilled for a total of 266 metres of drilling. The holes tested an open area to the west of an old stope mined from level 13 of the mine. Zone 32 was intersected in two of the three holes. Hole 108-156 intersected 8.82 g/t Au over 2.50 metres, including 25.95 g/t Au over 0.60 metres. The drilling confirmed the continuity of Zone 32 on the west side of a late, low-displacement fault. More drilling is planned to characterize an untested area approximately 25 m by 40 m to the west of the three completed holes. Sixteen infill holes totalling 1,450 metres were drilled over a distance of about 100 metres along strike and 50 metres vertically. Hole 48-07 intersected 60.65 g/t Au over 0.60 metres. Hole 48-09 intersected 10.73 g/t Au over 0.50 metres. Hole 48-10 intersected 8.20 g/t Au over 2.05 metres. Hole 48-13 intersected 11.21 g/t Au over 0.50 metres. Hole 48-14 intersected 10.25 g/t Au over 0.65 metres. Hole 51-06 intersected 26.14 g/t Au over 1.15 metres. The 350H project is located in the area of the mine’s external ramp. Veins 350H, 350H1 and 350H2 are stacked structures spaced some 10 m to 20 m apart in the direction perpendicular to their dip (30-35 degrees). The best continuity identified by drilling is associated with vein 350H1. Sampling normally consists of sawing the core into two equal halves along its main axis and shipping one of the halves to Val-d'Or for assaying at the ALS Geochemistry laboratory, which is fully accredited under ISO 17025. The samples are crushed, pulverized and assayed by fire assay with atomic absorption finish. Results exceeding 10.0 g/t are re-assayed using gravimetric finish. Certified standards and blanks are inserted into the sampling stream for quality control purposes. The technical and scientific content of this press release has been reviewed and approved by Petr Pelz, P.Geo., the Corporation’s qualified person under National Instrument 43101. Zone Q: True width corresponds to approximately 60-90% of the core length. 1700: True width corresponds to approximately 85% of the core length. Granodiorite East: True width corresponds to approximately 50% of the core length. Zone Q: True width corresponds to approximately 70-90% of the core length. Zone QH2: True width corresponds to approximately 55-90% of the core length. Zone 32: True width corresponds to approximately 75-80% of the core length. 350H project: True width corresponds to approximately 55-95% of the core length. Holes that returned grades below 1 g/t Au are not shown in the table. 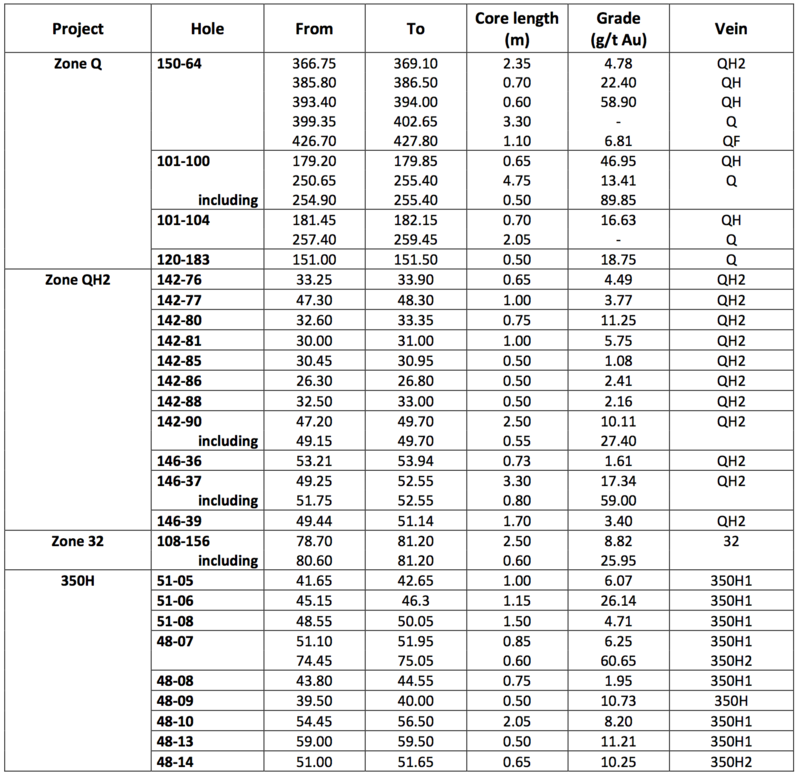 Zone Q project: Holes 120-182 and 120-183. Zone QH2 project: Holes 142-78, 142-79, 182-82, 142-83, 142-84, 142-87a, 142-91, 142-92, 142-93, 142-94 and 146-38. Zone 32 project: Holes 109-116 and 108-155a. 350H project: Holes 51-01, 51-02, 51-03, 51-04, 51-10, 48-11 and 48-12.